Here you can find transports to other domains with Tron information. If you have a site that is not listed, please feel free to email us about it. Any links listed that appear to be dead or have moved should also be reported. There is not much to be said about the game: you ride a lightcycle, a kind of motorbike that can't be stopped and leaves a wall where it goes. You can make turns of 90 degrees and can accelerate by driving close to walls. Make your enemies hit a wall while avoiding the same fate. 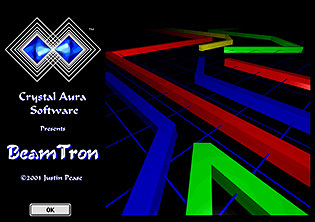 BeamTron, by Justin Pease, is a game for the Macintosh based on the movie called Tron. It's a classic arcade game where four players control lasers that leave behind trails in an arena, competing for space and thus survival. 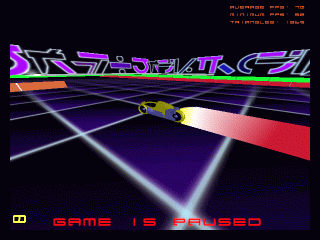 BeamTron features: diagonal movement and grid curving, with smooth 4-player gameplay. Requirements: Mac OS 7.0 or later. 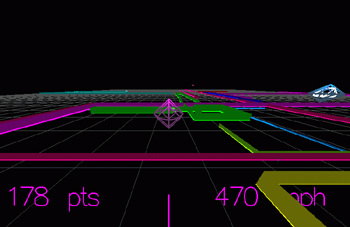 Though not as visually detailed as Lightcycles: GGoC, this is a great game. Includes full multiplayer support for internet and LAN games. You steer a futuristic bike, called lightcycle. Combat takes place in a rectangular arena. Your bike leaves a trail behind, which is like a wall. 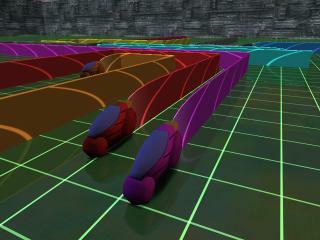 The goal is to force the other players to drive into a wall. The winner is the last player alive. Well, as the name suggests, it's inspired by the movie TRON. Or more exactly, by all the games that where inspired by the movie TRON. This is a 3D clone of the classic tron/lightcycles game that's been around for ages. If you have seen the movie called Tron, you probably remember the scene with the lightcycles - vehicles speeding around in a large arena leaving trails behind. This game puts you in control of such a vehicle. The goal of the game is simple - play, have fun and stay alive as long as possible. The basic game idea of the Tron lightcycle game is that you drive a fast futuristic bike, called lightcycle. It leaves a wall where it goes, so the arena turns into a labyrinth after some time. The goal is to force the enemies to hit a wall while you should try to avoid this for yourself, of course. The last player alive is the winner. An online Tron game using Java. Tron is the present-day video game sequel to the 1982 cult film classic that wasa landmark of computerized graphical ingenuity. TRON® 2.0, is a story-driven, first-person action game that propels the player into an alternate universe inside a computer. As Jet Bradley (son of the original films hero Alan Bradley) you will combat digital opponents using guns, rods, grenades, missiles, and the iconic TRON disc. Combining the best of the genre with a truly innovative look and breakthrough game play, TRON® 2.0 delivers an adventure unlike any other. It takes PC gaming to a new level with intense action, intense and deadly battles, and high-speed light cycle races.